I’m really pleased to let you know that the Library has purchased access to the final part of Gale Cengage’s British Library Newspapers collection (Part V). This means the Library now has access to the full British Library Newspapers, Parts I-V.
You can access British Library Newspapers via the Databases A-Z list or Newspapers databases list. 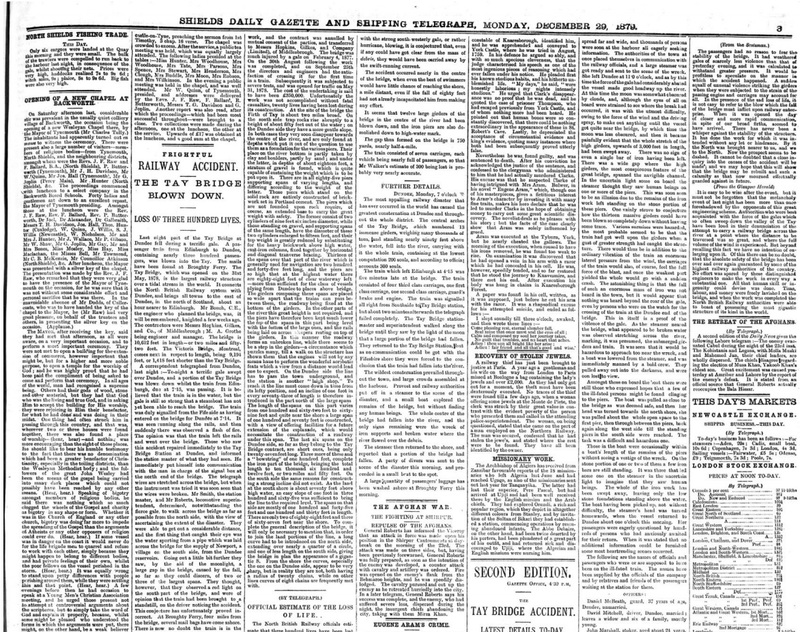 British Library Newspapers, Part V: 1746-1950, has a concentration of titles from the northern part of the United Kingdom with 36 individual titles included. This doubles coverage in Scotland, triples coverage in the Midlands, and adds a significant number of Northern titles to the British Library Newspapers collections. [Screenshot of] The Tay Bridge Accident. North & South Shields Daily Gazette and Shipping Telegraph (South Shields, England), Monday, December 29, 1879; pg. 3; Issue 7418. Accessed 10/07/17. Part V includes newspapers from the Scottish localities of Fife, Elgin, Inverness, Paisley, and John O’Groats, as well as towns just below the border, such as Morpeth, Alnwick, and more. Researchers will also benefit from access to important titles such as the Coventry Herald, which features some of the earliest published writing of Mary Ann Evans (better known as George Eliot). British Library Newspapers, Parts I-IV provides a comprehensive range of regional and local newspapers in Britain between the mid eighteenth and mid twentieth centuries. Taken directly from the extensive holdings of the British Library, the more than 160 publications illuminate diverse and distinct regional attitudes, cultures, and vernaculars, providing an alternative viewpoint to the London-centric national press over a period of more than 200 years. While the Library has had access to Parts I-IV for a few years now, I know staff and students have been very keen for us to purchase the final collection (Part V) to ensure full access to this substantial and vital collection. I’m really happy the Library has finally been able to do this and I hope this will prove useful for your learning, teaching and research needs. Does this mean the Library has access to the British Newspaper Archive from the British Library? No, not quite. The British Newspaper Archive is a separate database, though it covers much of the same material. See Do we have access to the British Newspaper Archive? for a full explanation. Are these the only newspaper archives the Library has access to? No. The Library has access to quite a wide range of digital newspaper archives, as well as databases that allow you to search for and access full-text of current newspapers and news sources. You can see what is available and how to access them on the Newspapers database list. You can access British Library Newspapers and all other newspaper databases either through the Databases A-Z list or the Newspapers database list. Caroline Stirling – Academic Support Librarian for School of History, Classics and Archaeology. This entry was posted in Library, New, Online resource, Primary sources and tagged 18th century, 19th century, 20th century, Britain, Databases, History, newspapers, primary source by cstirling. Bookmark the permalink.